The Fitmaster comes jam-packed with features to help the precision-oriented fitter. Hold your mouse over the feature to learn more. 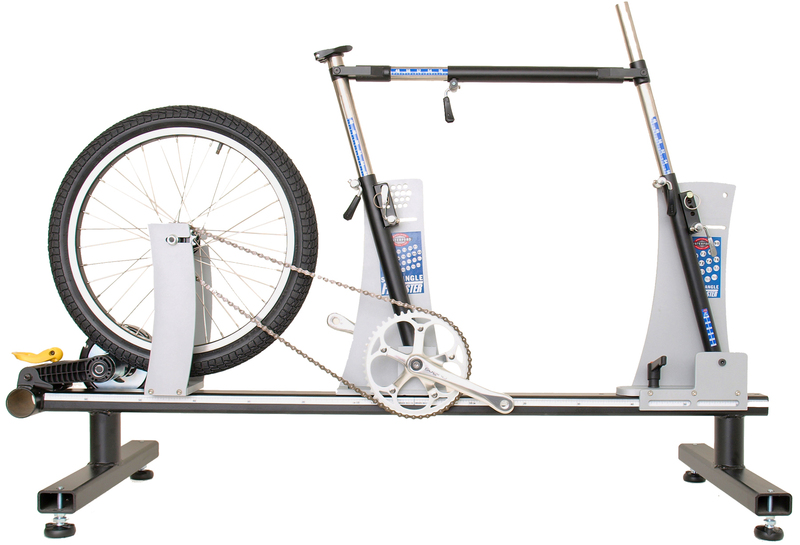 No other machine lets you size both stock and custom bike fits as the Fitmaster. Extensive adjustabilty lets you fit from 45cm to 70cm center to center seat tube and from 48cm to 70cm top tube (an even longer top tube with a sloped top tube. Easily set up to mimic stock geometry bikes. This lets you reduce floor stock, easily justifying the investment. The Fitmaster is Stack and Reach compatible. WYSIWYG (What you see is what you get): you can give your clients a pretty good idea of what their frame will look, including the top tube slope. Easy set up and adjustment: You can adjust the Fitmaster easily thanks to quick release length and angle adjustments. The design has been fine tuned to provide smooth action. The solid base gives rider confidence. The feet under the base remain fixed while the front end slides over the top. Sturdy construction makes this an excellent long term asset.